Among the issues Apprising Ministriescovers is how even the heretical Word Faith movement continues heading toward acceptance within the mainstream of evangelicalism. Unless you’ve been living in a cave you know that Gospel Coalition Council member James MacDonald has invited notorious blab it, grab it Word Faith modalist T.D. Jakes into his Elephant Room 2. ER’s goal is to form a new unified tribe as I recently showed you in Dung Droppings From The Elephant Room: Greg Laurie. It’s important for you to understand that the first ER served to create a strong bond with Seeker Driven, i.e. man-centered, Prophet-Führer Steven Furtick and that would help launch this false teacher further into the mainstream of the church visible. So we have solid reason to believe the same will happen with T.D. Jakes. Apparently, Word Faith heretic Joel Osteen will be the next prosperity preacher ushered into the mainstream of spiritually spineless evanjellyfish. Consider that Furtick has already proclaimed Joel Osteen Is A Great Man Of God and Megachurch Pastors Joel Osteen And T.D. Jakes Unite And Why You Should Care. 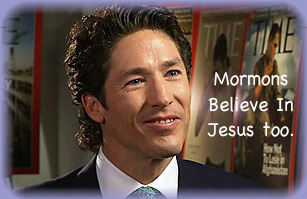 Joel Osteen, pastor of America’s fastest growing megachurch, has reiterated his opinion that GOP presidential hopeful Mitt Romney is a “believer in Christ like me” and that the former Massachusetts governor’s confession of Jesus as the Son of God is “enough” for him. So we’re not surprised that Joel Osteen hold this view; after-all, James Robison Says Jesus Is In The Heart Of Mormon Glenn Beck. This is what happens when we appeal to our fickle feelings and do theology by liver shiver. What’s surprising is new evangelical darling Prophet-Führer Steven Furtick is seemingly so dense spiritually he thinks Joel Osteen’s a solid Christian. With his wife as pastrix and his Robert Schuelleresque pamblum, he certainly is not. Be sure we’re not caught chasing down rabbit trails. The issue is not whether Mitt Romney is a moral man; the issue is that he like Glenn Beck are faithful slaves to the non-Christian cult of the Church of Jesus Christ of Latter-day Saints (the Mormons). Osteen has “a common bond” with them? Jess L. Christensen, Institute of Religion director at Utah State University, Logan, Utah. On first hearing, the doctrine that Lucifer and our Lord, Jesus Christ, are brothers may seem surprising to some—especially to those unacquainted with latter-day revelations. But both the scriptures and the prophets affirm that Jesus Christ and Lucifer are indeed offspring of our Heavenly Father and, therefore, spirit brothers. No, a great man of God will hate that doctrine from the pit of hell and preach the Gospel to Mitt Romney.